A day after I posted “6 THINGS YOU SHOULD KNOW ABOUT SENDING MONEY TO THE PHILIPPINES THRU CIMB’S SPEEDSEND,” I came across an article about OFW’s possible chance to send money to the Philippines using the controversial messaging application for Facebook (Facebook Messenger). My excitement was heighten and I was already picturing the future. “Messenger’s payment option lets users send money in a message similar to how they can send a photo. 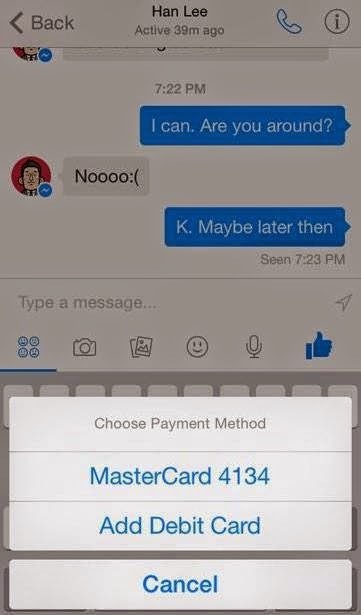 Users can add a debit card in Messenger, or use one they already have on file with Facebook. An in-app pincode also exists for added security around payments,” said the popular technology site techcrunch. “All Facebook has to do is turn on the feature. The sender should then simply hit a button to initiate a payment, enter the amount, and send it. Facebook keeps the transaction private and doesn’t publish anything about it to the News Feed,” said Andrew Aude, a Stanford computer science student. Techcrunch also revealed that it’s unclear whether Facebook will monetize Messenger by charging a small fee for money transfers, or offer the functionality for free to drive usage of its standalone chat app. That will be up to David Marcus, the new head of Messenger who was formerly the president of PayPal. With about 30 million Filipinos working abroad it will be a humongous advantage which won’t require our presence at the bank, and will certainly save us money, time and effort from traveling to the bank and back. I just hope they would be able to compete to other renowned services such as Paypal. If this pushes through, Facebook Messenger payments could compete with Venmo, PayPal, Square Cash, and other peer-to-peer money transfer apps.